I have only enabled the first four of these, but here are all hidden preferences for disabling animations I have found. Animation is everywhere in OS X, and it is not possible to disable all animation with one global setting, which makes this a very complicated question to answer completely. I would advise you to try disabling things one at a time as you find animations that annoy you. Check System Preferences to start. For example, the Dock magnification animation can be turned off in System Preferences -> Dock. In addition to the answers above, you can also use Secrets. 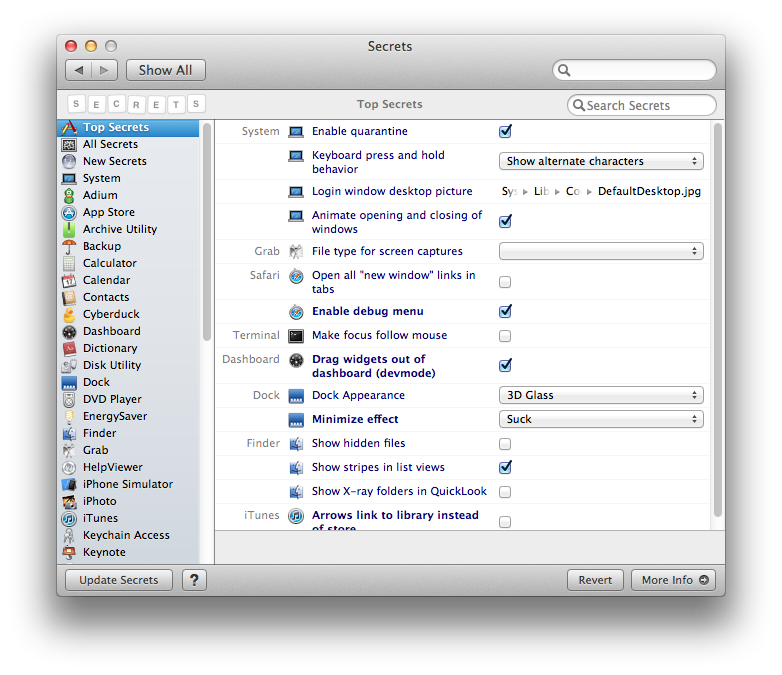 Secrets is an open source PrefPane that lets you set all sorts of hidden options for all sorts of programs on your Mac. Update: The main site is down and the project looks to be dead. Here is the Google Code Archive if you still want to use the vanilla version. If you're wary of Terminal, Mountain Tweaks is another helpful GUI to turn off, turn on and otherwise tweak the behavior of Lion and Mountain Lion. This answer, wrapped up as a shell script that allows you to toggle between states. enables or disables animations in osx. if you don't pass any arguments, it'll toggle between enabled and disabled. echo "animations disabled - reboot may be required"
echo "animations enabled - reboot may be required"
Not the answer you're looking for? Browse other questions tagged macos animation . Is there a way to cancel or disable the minimize animation completely? Disable slow window animation on OS X El Capitan?